Enviropeel Corrosion Protection & Prevention Alpha Industries Ltd.Alpha Industries Ltd.
Enviropeel’s amazing sprayable anti-corrosion system and coatings can help you solve a broad range of problems found in any harsh environments. Our products provide solutions for premature bearing failure, pipe flange corrosion, deterioration of equipment in long term storage, and preventing rust on problem substrates. 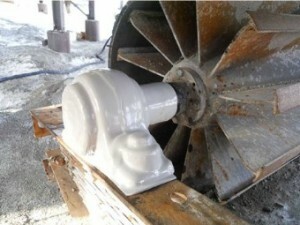 In the mining industry, Enviropeel has been extending bearing life by 500% through prevention of contamination ingress into the rotating system. The ability to apply this protection on-site to installed equipment in any climate along with the tremendous cost savings is making Enviropeel a requirement for many companies. 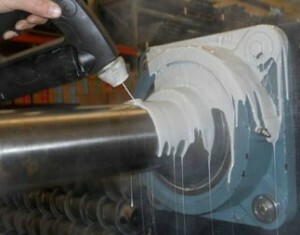 Enviropeel being a solid at standard temperatures is melted in a computer-controlled heating tank to form a sprayable liquid. Pumped along specially designed, heated hoses to the spray gun, the material can be sprayed on to the substrate, forming a perfectly fitting ‘second skin’. Inhibitors within Enviropeel coat all surfaces inside the protected area, penetrating between surfaces and along bolt threads. Corrosion inhibitors continue to be released, providing continuous active protection for the lifetime of the system, sealed within the protective shell of the Enviropeel material. Enviropeel has undertaken a variety of tests, both in the lab and in the field, that show how well it performs. 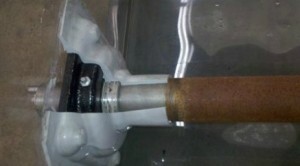 In-house and 3rd party ASTM B117 hot salt fog testing showed that areas within the Enviropeel protection zone stayed in perfect condition and other tests, including cryogenic, accelerated UV pinhole and film integrity testing, have shown outstanding corrosion protection in a variety of aggressive environments. Interested in seeing more Enviropeel? Request a demo, more information, or get a coating quote?